Rather than being judgmental and critical of each other, may we have the pure love of Christ for our fellow travelers in this journey through life. Our souls have rejoiced tonight and reached toward heaven. We have been blessed with beautiful music and inspired messages. The Spirit of the Lord is here. I pray for His inspiration to be with me now as I share with you some of my thoughts and feelings. I begin with a short anecdote which illustrates a point I should like to make. A young couple, Lisa and John, moved into a new neighborhood. One morning while they were eating breakfast, Lisa looked out the window and watched her next-door neighbor hanging out her wash.
John looked on but remained silent. Every time her neighbor would hang her wash to dry, Lisa would make the same comments. Tonight I’d like to share with you a few thoughts concerning how we view each other. Are we looking through a window which needs cleaning? Are we making judgments when we don’t have all the facts? What do we see when we look at others? What judgments do we make about them? Said the Savior, “Judge not.”1 He continued, “Why beholdest thou the mote that is in thy brother’s eye, but considerest not the beam that is in thine own eye?”2 Or, to paraphrase, why beholdest thou what you think is dirty laundry at your neighbor’s house but considerest not the soiled window in your own house? None of us is perfect. I know of no one who would profess to be so. And yet for some reason, despite our own imperfections, we have a tendency to point out those of others. We make judgments concerning their actions or inactions. Forty-seven years ago this general conference, I was called to the Quorum of the Twelve Apostles. At the time, I had been serving on one of the general priesthood committees of the Church, and so before my name was presented, I sat with my fellow members of that priesthood committee, as was expected of me. My wife, however, had no idea where to go and no one with whom she could sit and, in fact, was unable to find a seat anywhere in the Tabernacle. 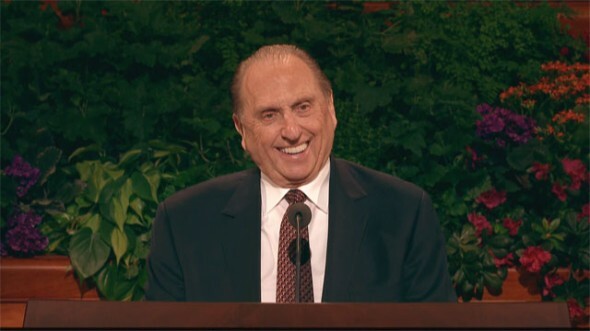 A dear friend of ours, who was a member of one of the general auxiliary boards and who was sitting in the area designated for the board members, asked Sister Monson to sit with her. This woman knew nothing of my call—which would be announced shortly—but she spotted Sister Monson, recognized her consternation, and graciously offered her a seat. My dear wife was relieved and grateful for this kind gesture. Sitting down, however, she heard loud whispering behind her as one of the board members expressed her annoyance to those around her that one of her fellow board members would have the audacity to invite an “outsider” to sit in this area reserved only for them. There was no excuse for her unkind behavior, regardless of who might have been invited to sit there. However, I can only imagine how that woman felt when she learned that the “intruder” was the wife of the newest Apostle. Not only are we inclined to judge the actions and words of others, but many of us judge appearances: clothing, hairstyles, size. The list could go on and on. A classic account of judging by appearance was printed in a national magazine many years ago. It is a true account—one which you may have heard but which bears repeating. A woman by the name of Mary Bartels had a home directly across the street from the entrance to a hospital clinic. Her family lived on the main floor and rented the upstairs rooms to outpatients at the clinic. One evening a truly awful-looking old man came to the door asking if there was room for him to stay the night. He was stooped and shriveled, and his face was lopsided from swelling—red and raw. He said he’d been hunting for a room since noon but with no success. “I guess it’s my face,” he said. “I know it looks terrible, but my doctor says it could possibly improve after more treatments.” He indicated he’d be happy to sleep in the rocking chair on the porch. As she talked with him, Mary realized this little old man had an oversized heart crowded into that tiny body. Although her rooms were filled, she told him to wait in the chair and she’d find him a place to sleep. At bedtime Mary’s husband set up a camp cot for the man. When she checked in the morning, the bed linens were neatly folded and he was out on the porch. He refused breakfast, but just before he left for his bus, he asked if he could return the next time he had a treatment. “I won’t put you out a bit,” he promised. “I can sleep fine in a chair.” Mary assured him he was welcome to come again. In the several years he went for treatments and stayed in Mary’s home, the old man, who was a fisherman by trade, always had gifts of seafood or vegetables from his garden. Other times he sent packages in the mail. True, the woman who was chosen was not “model slim.” But those who knew her and knew her qualities saw in her far more than was reflected in the photograph. The photograph did show that she had a friendly smile and a look of confidence. What the photograph didn’t show was that she was a loyal and compassionate friend, a woman of intelligence who loved the Lord and who loved and served His children. It didn’t show that she volunteered in the community and was a considerate and concerned neighbor. In short, the photograph did not reflect who she really was. I ask: if attitudes, deeds, and spiritual inclinations were reflected in physical features, would the countenance of the woman who complained be as lovely as that of the woman she criticized? My dear sisters, each of you is unique. You are different from each other in many ways. There are those of you who are married. Some of you stay at home with your children, while others of you work outside your homes. Some of you are empty nesters. There are those of you who are married but do not have children. There are those who are divorced, those who are widowed. Many of you are single women. Some of you have college degrees; some of you do not. There are those who can afford the latest fashions and those who are lucky to have one appropriate Sunday outfit. Such differences are almost endless. Do these differences tempt us to judge one another? Mother Teresa, a Catholic nun who worked among the poor in India most of her life, spoke this profound truth: “If you judge people, you have no time to love them.”5 The Savior has admonished, “This is my commandment, That ye love one another, as I have loved you.”6 I ask: can we love one another, as the Savior has commanded, if we judge each other? And I answer—with Mother Teresa: no, we cannot. I consider charity—or “the pure love of Christ”—to be the opposite of criticism and judging. In speaking of charity, I do not at this moment have in mind the relief of the suffering through the giving of our substance. That, of course, is necessary and proper. Tonight, however, I have in mind the charity that manifests itself when we are tolerant of others and lenient toward their actions, the kind of charity that forgives, the kind of charity that is patient. I have in mind the charity that impels us to be sympathetic, compassionate, and merciful, not only in times of sickness and affliction and distress but also in times of weakness or error on the part of others. There is a serious need for the charity that gives attention to those who are unnoticed, hope to those who are discouraged, aid to those who are afflicted. True charity is love in action. The need for charity is everywhere. Charity is having patience with someone who has let us down. It is resisting the impulse to become offended easily. It is accepting weaknesses and shortcomings. It is accepting people as they truly are. It is looking beyond physical appearances to attributes that will not dim through time. It is resisting the impulse to categorize others. In a hundred small ways, all of you wear the mantle of charity. Life is perfect for none of us. Rather than being judgmental and critical of each other, may we have the pure love of Christ for our fellow travelers in this journey through life. May we recognize that each one is doing her best to deal with the challenges which come her way, and may we strive to do our best to help out. “Charity never faileth.” May this long-enduring Relief Society motto, this timeless truth, guide you in everything you do. May it permeate your very souls and find expression in all your thoughts and actions. I express my love to you, my sisters, and pray that heaven’s blessings may ever be yours. In the name of Jesus Christ, amen. Adapted from Mary Bartels, “The Old Fisherman,” Guideposts, June 1965, 24–25. Mother Teresa, in R. M. Lala, A Touch of Greatness: Encounters with the Eminent (2001), x.
Horace Mann, Lectures on Education (1845), 297.